The pco.edge 4.2 camera is equipped with an innovative scientific CMOS sensor (sCMOS) providing crisp images and precise measurements. The pco.edge series can be optionally upgraded with a water cooling system. 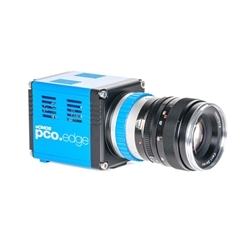 The pco.edge 4.2 camera system is designed for users who require high quantum efficiency. The camera has 16 bit dynamic range, high frame rates, long exposure times and extremely low readout noise. The monochrome camera is available with camera link, USB3 or Camera Link HS. Please contact Microscope World for a quote or further information on the pco.edge 4.2 camera. View pco.edge 4.2 data sheet. NOTE: This camera is not returnable.